WITH A NEW FOREWORD BY VAL McDERMID Therese is just an ordinary sales assistant working in a New York department store when a beautiful, alluring woman in her thirties walks up to her counter. Standing there, Therese is wholly unprepared for the first shock of love. Therese is an awkward nineteen-year-old with a job she hates and a boyfriend she doesn't love; Carol is a sophisticated, bored suburban housewife in the throes of a divorce and a custody battle for her only daughter. 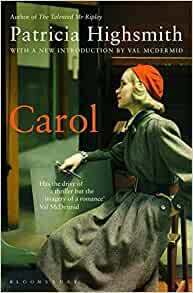 As Therese becomes irresistibly drawn into Carol's world, she soon realizes how much they both stand to lose...First published pseudonymously in 1952 as The Price of Salt, Carol is a hauntingly atmospheric love story set against the backdrop of fifties' New York. Start reading Carol: A Virago Modern Classic (Virago Modern Classics) on your Kindle in under a minute. Incredible. Don’t you feel a bit silly when you sort of half see a film between shifts in the kitchen and think I must read that book? I know I do, because it seems as if you are being led by advertisers to the slaughter but because of Christmas preparations I missed half of Carol on the TV and I couldn’t work out whether or not it had a happy ending as it was all a bit vague. I saw enough to be interested, so I ordered the book. Was I in for a treat! 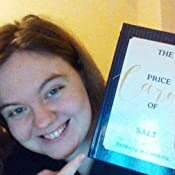 I wouldn’t go so far as to say I like the Georgian style of writing, that is very quaint and too long-winded for me, but my taste usually lands somewhere between Steinbeck and Hemingway. 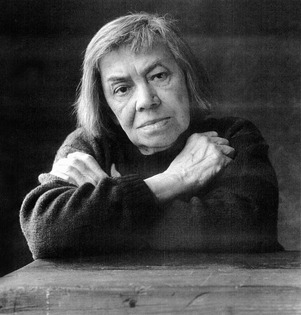 What makes Patricia Highsmith’s writing so special is that amongst her overt simplicity a beautifully descriptive phrase will come out of nowhere. I am thinking of phrases like “her short fair hair that made Therese think of perfume held to a light”. The writing style is so simple that this book can speak to anyone; it is beautiful at times, stark and brutal at others, but always evocative. Both of those sum it up beautifully. 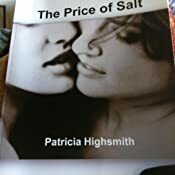 Today young people are often (but not always) out and proud and it is probably hard to empathise with the level of restrained passion and yearning in this novel but Patricia Highsmith’s characterisation is so good you can’t but feel every nuance along with them, every last bit of yearning, every pang of disappointment. It is a beautiful story and a terrifying one therefore when their happiness so quickly turns into an ordeal of persecution. In the book, you see Therese is less of an innocent, Carol is less of a seducer and both are tormented by circumstances they cannot hope to control. Carol’s sacrifice and bravery is so much clearer than in the film too, Therese’s pain and coming to terms with the loss of her first true love is still there but she hurts others as much as she is hurt by them. Richard is a brute. We don’t see much of this in the film and the ending is far less optimistic. I often prefer the book to the film, but I was grateful for the film because it led me to an unforgettable read that had me up all night. This is not just a book for those interested in LGBT rights or lesbian romance because it has a very clear truth at its heart. One that all adults know. There is nothing quite like falling in love. It overwhelms you totally and the rush of endorphins is unbelievable. That is probably why so many people are addicted to love of course and continually searching for “The One”. They never find “The One” because harsh reality and even sexual satisfaction itself can take the shine right off that first rush of overwhelming tenderness and desire and yet sometimes, just sometimes, if you can live through the pain and the sheer ordinariness of life, a deeper and stronger affection is born. That is the happiest ending of all and in Carol you live through these characters and feel every emotion they do which makes the ending just perfect in its optimism. • You can leave a response, or trackback from your own site.Edit this entry. I read this after watching the film Carol. Normally I don’t bother to read a book if I happen to see the film first but felt compelled to do so in this instance to see how much the screenplay had been altered. This is a far cry from my usual genre of book, but I had recently watched the movie. The movie isn't my typical genre either, but it had been one of the best I had seen for a very long time. I immediately wanted to read the book from which it had been based upon. I really did love this story of Carol and Therese. A sweet love story. A story of two strangers, eyes meeting across a crowded department store. A look that develops into so much more. Reading the relationship between Carol and Therese grow, I really found myself willing them their happy ending. This is book that I can't recommend enough. I'd been meaning to read this for years as it is named as a classic. Unfortunately it just didn't work for me at all. I enjoyed the writing style but I really didn't like either of the main characters and I couldn't connect with them or even see why they connected with each other. There was no spark and I found them self-obsessed, obsessive and not really very nice characters. Maybe that was the point and that would have been fine if there had been any believable connection between them but for me there really wasn't and I found myself skimming through it toward the end.